Mega Shark vs. Mecha Shark, the third installment of the amazing “Mega Shark vs.” series, is now on Netflix streaming! In 2009’s Mega Shark vs. Giant Octopus, a megaladon and a giant octopus were accidentally released by climate change, which led to a path of destruction around the world… until a scientific team involving Debbie Gibson convinced them to fight each other to the death! In 2010’s Mega Shark vs. Crocosaurus, apparently the megaladon didn’t die, and now there’s also a giant crocodile! Also Jaleel White, TV’s Steve Urkel, played a scientist. At this point, the military is ready for the megaladon, thanks to a mechanical giant shark they built! Also Debbie Gibson is back! 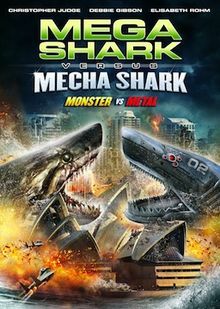 Mega Shark vs. Mecha Shark should be as awesome as the first two! We’ll be watching starting at 10:00 P.M. eastern on Wednesday, 4/23. Please join us, and join the conversation on twitter with hashtag #MegaVsMecha !